Wilkinson grave, in graveyard of disused St.John's Church of Ireland, John's Square, Limerick. Also here. Need to ask Limerick Corp about access. 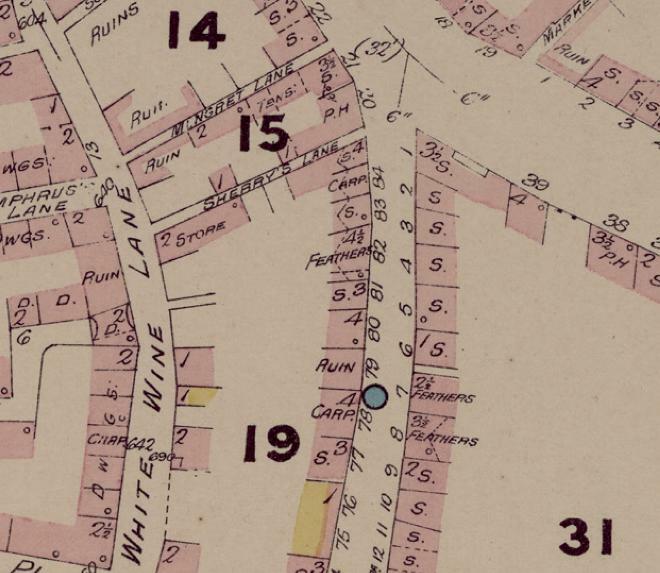 Location of William Wilkinson's house and business, 4 Mungret St, Limerick (near corner with John's Street to the N). From Insurance plan of Limerick, 1897, by Charles E. Goad, Leonard Collection at UL library. The location is completely cleared today. See street view. Protestant merchant, working in the dyeing business in Limerick city. Listed as Tradesman, Church of Ireland, living Mungret St, Limerick, at mar. He mar 5 Apr 1853, St.John's (CoI), Limerick, to Mary Anne Gould [born 1832]. See mar cert from [GROI]. She inherited Gould family wool business in Mungret Street, Limerick. They lived Mungret St, Limerick, at least 1853 to 1869. 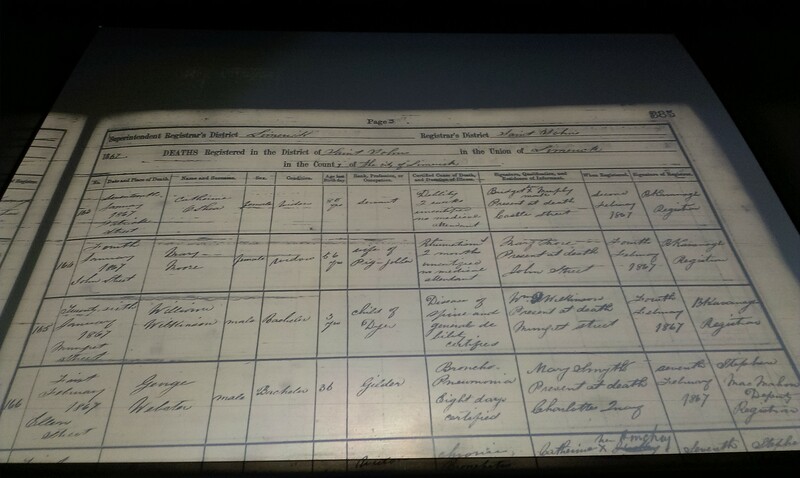 William is listed as "Dyer", Mungret St, at children's bapts 1854-60. 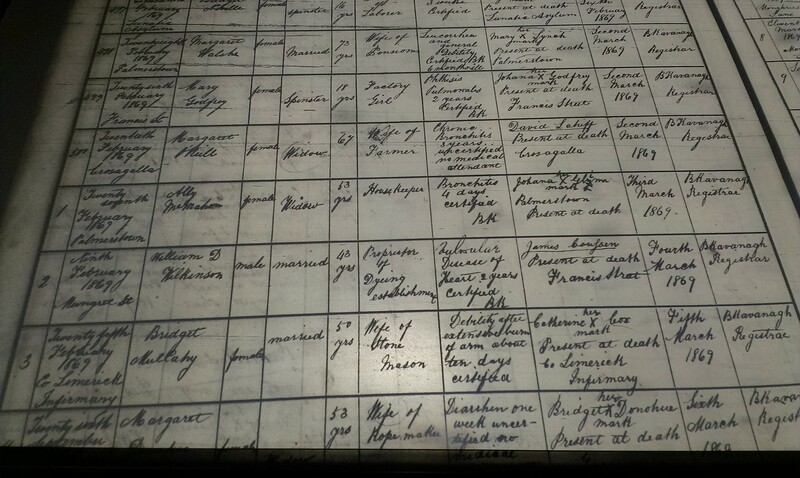 Probate of Mary Anne's father's will granted 8th May 1854. William is listed as "Blackdyer", Mungret St, at son's bapt 1863. Even though he was Protestant, he witnessed the Catholic marriage of what must be his wife's 1st cousin William Ebrill in 1864. William Wilkinson, 4 Mungret St, listed under "Dyers" in [Henry & Coghlan's directory, 1867]. Listed as "Dyer", Mungret St, at son's death 1867. He died at his home, Mungret St, Feb 9, 1869, aged 43 years, of heart disease. See death in [GROI]. He is listed as "proprietor of dyeing establishment". He was bur Wilkinson grave, St.John's (CoI), Limerick. See death notice in Limerick Chronicle, 9 Feb 1869. She later lived with her son James, apparently at "Strand, Circular Road", Limerick (this must be Ivy Bank, close to North Circular Road). She died July 9, 1897, age 65 yrs, at her son James' house, Ivy Bank, Ennis Rd, Limerick. See death notice in Limerick Chronicle, 10 July 1897. 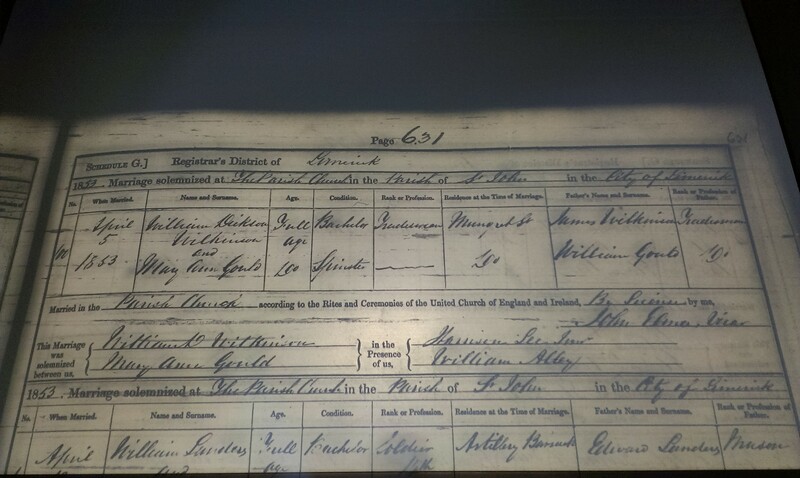 Funeral Sun 11 July 1897, bur Wilkinson grave, St.John's (CoI), Limerick, see burial record. bapt 28 Mar 1854 [St.John's CoI, Limerick]. bur Wilkinson grave, St.John's (CoI), Limerick. 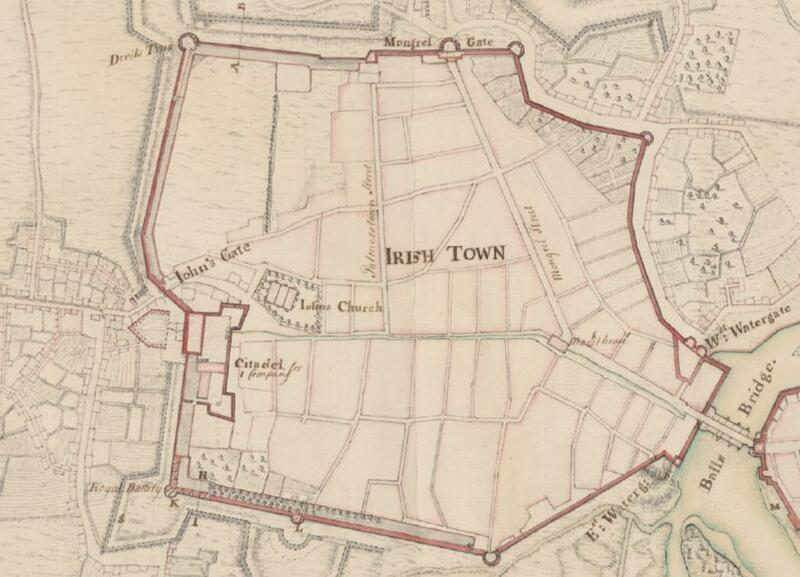 St.John's CoI church (location of Wilkinson grave) on Map of Limerick, 1752, by William Eyres, at [BL]. S is to the left. The medieval St.John's church was at the S end of the medieval walled city of Limerick. See 1829 to 1842 map. St.John's church was re-built 1843. It is now disused. See street view.